The edifice of the Heroon found on the east slope of the theatre dates from the late 2nd or early 1st century BC, and is one of the three burial monuments within the walls of the city of Miletus that have been studied. The complex was built from east to west on the remains of a building of the early Hellenistic period, measuring 42.8X33.8-34.1 metres. 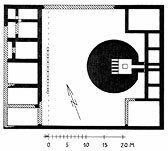 It comprised two series of rooms on its narrow sides, and a large central yard where the Heroon was situated. The masonry of the building was uniform: a course of limestone slabs and one or two layers of gneiss slabs created the foundation, while marble was used for the construction. On the west side of the building there was a group of six rooms of equal length, about 8 metres long, but of different width and varying interior arrangement. In two of these, there were pebble floors, while pipes were discovered in others. These areas must have been accessed directly or indirectly both from west and east. 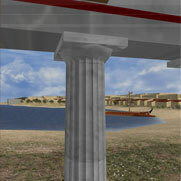 In front of the rooms of the west side there was a Ionic stoa, from which capitals, and components of the cornice and the architrave have been preserved. The burial structure occupied the east section of the courtyard of the building. 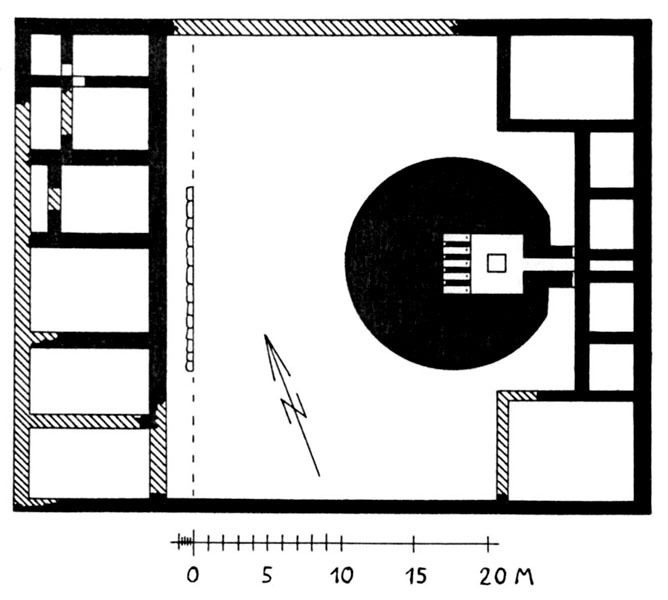 It was compact like a tumulus, with an ellipsoidal plan. It was built of large slabs of limestone, which surrounded the barrel vaulted burial chamber (3.57X4.17 metres). A vaulted passageway led there. In the west wall of the chamber, there were five tomb cases lying side by side, arranged parallel to each other. Their entrance was sealed by marble slabs. In the central section of the chamber's floor, a one-metre deep pit was dug (approximately 2X1.2 metres), coated in marble and covered with a marble stone. It remains unknown whether this grave was the main burial, or was an ossuary receiving burials from the adjacent tomb chamber. The initial form of the Heroon cannot be restored because the whole edifice went through repeated modifications from Hellenistic up to Byzantine times. East of the Heroon there was a series of six rooms, each two showing similarities and serving, like the rooms on the west side of the edifice, for funeral banquets. Heroa were burial monuments in which the cult of the heroified dead took place, and they were situated, like temples, in a sanctuary. In Miletus two more heroa are extant: the Hellenistic Heroon at the area of the West Agora, and the Roman Heroon north of the Faustina Thermae.